We know this is true: Americans have a strong desire to become homeowners (79% among non-homeowners, according to the latest ValueInsured Modern Homebuyer Survey) and the next generation continues to view homeownership as an important part of their American Dream (78% among millennials). However, increasing evidence shows they may not enjoy the process of actually buying a home. In 2017, Trulia found 51% of all homeowners have regrets about the process they went about to buy their home. Now, ValueInsured reports 59% of all existing homeowners have negative sentiments associated with their most recent home-buying experience. 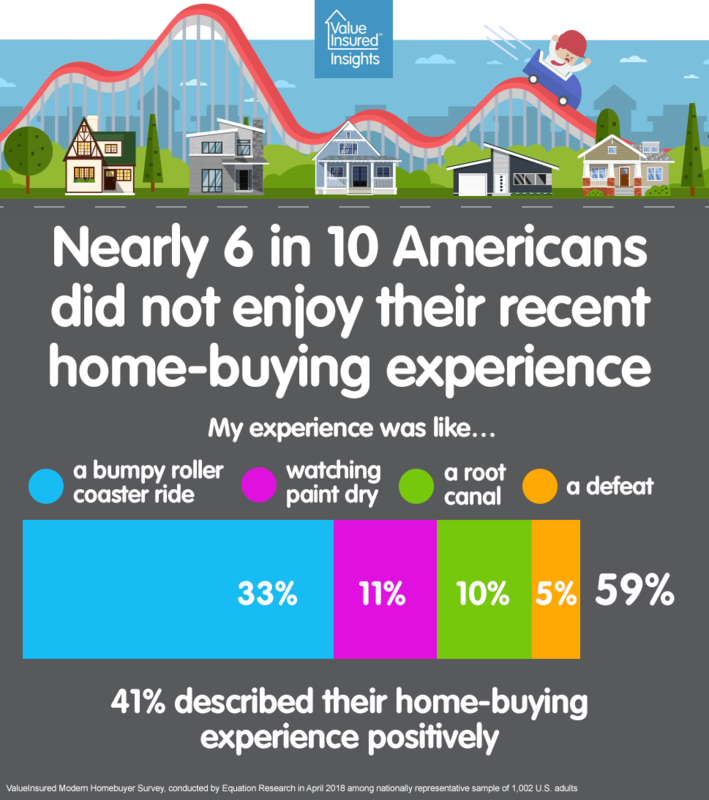 33% chose to describe their home-buying experience as similar to “a bumpy roller coaster ride.” It indicates at least a third of homeowners likely have experienced surprises or unpredictability during their recent home-buying process. When they are the backbone of a $31.8 trillion housing industry and support millions of jobs, it begs the question why nearly 6 out of 10 homeowners did not have a more pleasant home-buying experience. Gen-Xers and millennials appear to have it worse than older homeowners. 72% of all Gen-X homeowners described their most recent home-buying experience negatively, while 69% millennials did the same.